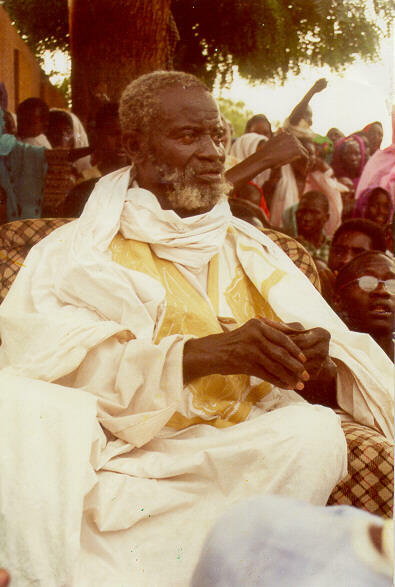 Serigne Saliou Mbacke-Master of the Universe!!! The master is more powerful than we could ever imagine. 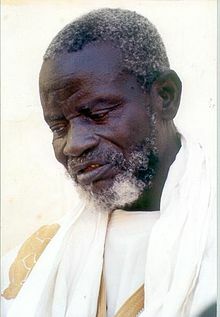 Today eye woke up with a feeling of extreme love for my master Serigne Saliou Mbacke. eye could not even recite my normal morning wird/zikr/mantra. ALL eye could do is repeat His name over and over again! My heart was full of Divine Bliss. My consciousness was flooded with scenes from the many experiences eye had with Him when eye was in Senegal, west africa. Eye first went to see the master in 1996. When eye saw Him for the first time, the Divine Light that emanated from him was too much for my consciousness! All eye can remember was sitting in front of Him with my hands in His hands, taking the initiation, and then passing OUT…Two disciples had to pick me up, and carry me away! Eye can vividly remember my feet dragging in the sand as eye came back to this side of consciousness. At the time eye went to Senegal eye was very fascinated with the idea of astral projection. On the very first night, after taking initiation(bayat), my master Serigne Saliou Mbacke came to me on the astral plane and took me out of my body! As we were traveling up into the heavens eye could clearly see the stars passing by us in the form of streams of LIGHT…Once when eye was with the master, my eyes began overflowing with tears and eye went into a trance state. While eye was in this state Serigne Saliou made everything disappear, there was no earth, no sky, and all of the people who where there vanished!! It was just me and the master suspended in a timeless place. In this place, before creation, the master spoke some words directly to me that eye will never forget!!! On two other occasions when eye would sit with the master, he would speak to the disciples in wolof, and to my surprise eye would hear his voice speaking english in my heart. It was at this point that eye knew that His voice was the voice of Allah/God!!! 3 years before eye went to Senegal, my beloved mother made her transition to the spiritual world from cancer. On the day before her transition eye went to sit by her bed side. As eye sat there eye heard a small still voice in my heart whisper “your mother is going to the other side.” On the very next day, she was gone. Eye was sure that the still voice that spoke to me was the voice of God!!! To my amazement the EXACT SAME TONE AND PITCH that eye heard from Serigne Saliou Mbacke in my heart, was the EXACT same voice eye heard when my mother was making her transition…. eye have seen GOD…..these are the confessions of a true disciple..and yes there is MOOR!!!!!!!!!!!!!!!! Posted on May 21, 2012, in ALCHEMY, Allah, Cheikh Ahmadou Bamba, Cheikh Betcio, consciousness, destiny, ENLIGHTENMENT, God, Guru, Hari Krishna, hinduism, love, mantra, meditation, mind, Muridism, mystic, non dual advaita, OM, self knowledge, Self Realization, soul, spirit, spiritual, sufism, wisdom, yoga and tagged abu yazid, avatar, oneness, purification of the soul, religion, spirituality, sufi story, the heart, voice of god. Bookmark the permalink. 9 Comments. The truth expressed here soul openly only confirms my own INperiences in the state of divine ONEness! Thankh you for sharing most glorious divine Sufi! Obliged light bearer! We are moved by the spirit….never question when or why…..it is done n so you BE! This is NOT a radical concept, just a concept that most are not properly educated on. There are many examples of this concept almost all religious and spiritual philosophies. For example this concept can be seen in the Hindu concept of Avatar, Adam Kadmon of Jewish Mystical tradition, the Anthropos or Primeval Cosmic Man of Christian Mystical tradition, and can also be seen in Kemetic Mysticism and many other spiritual traditions. The origin of the perfect being is heavily derived from the Islamic tradition through referring to the hadiths and in in-depth interpretation of the Quran. In the Quran, man’s hierarchical status above all beings is seen, as it states that God created humans in the fairest stature. Due to this occurrence the human is favored by God and is said to be given God’s light which leads the human through to complete perfection. The previous saying illuminates the idea that the true objective behind creation is God’s desire to be known, which is fulfilled through the perfect human being. This perfect human being is reflective of the “pre-existing entity of Muhammad”, which is not meaning the physical prophet Muhammad but rather the divine light created before the beginning. The pre-existing entity is the reflection of God in its purest form. When an individual understands that there is no separation between human and God they begin on the path of ultimate oneness. The one who decides to walk in this oneness pursues the true reality and responds to God’s longing to be known. The search within for this Reality of oneness causes one to be reunited with God, as well as, improve self-consciousness. This developed self-consciousness and self-realization then prompts divine self-manifestation. This divine consciousness and realization causes the Perfect Human to be of both divine and earthly origin, Then Sufi master, Ibn al-Arabi, calls this Perfect Human the Isthmus. Being the Isthmus between heaven and Earth the Perfect Human fulfills God’s desire to be known and God’s presence can be realized through Him by others. This is a radical concept only to those who have not been granted clear knowledge of the concept. The origin of the perfect being is heavily derived from the Islamic tradition through referring to the hadiths and in-depth interpretation of the Quran. In the Quran, man’s hierarchical status above all beings is seen, as it states that God created humans in the fairest stature. Due to this occurrence the human is favored by God and is said to be given God’s light which leads through them to complete perfection. The previous saying illuminates the idea that behind the true objective behind creation is God’s desire to be known, which is fulfilled through the perfect human being. This perfect human being is reflective of the “pre-existing entity of Muhammad”, which is not the prophet Muhammad but rather the divine light created before the beginning. The pre-existing entity is the reflection of God‘s nature in its purest form. When an individual understands that there is no separation between human and God they begin on the path of ultimate oneness. The one who decides to walk in this oneness pursues the true reality and responds to God’s longing to be known. The search within for this Reality of oneness causes one to be reunited with God, in turn, improving Self-consciousness. Through this developed Self-consciousness and Self-realization the Perfect Human is then of both divine and earthly origin, Sufi master, Ibn Al-Arabi calls the Perfect Human the Isthmus. Being the Isthmus between heaven and Earth the perfect human fulfills God’s desire to be known and God’s presence can be realized through Him by others. I ELOHIM HAVE NEVER MET A NON PERFECT HUMAN ONLY PERFECT HUMANS ASLEEP, I HOPE YOU KEEP THIS SITE GOING MAYBE IT WILL WAKE SOME OF THEM UP. (SMILE) . I know you have seen God but have you seen Shaykh Bethio?